No need to add to the cost of your order by paying a delivery charge. If you select Collect+ you can have your order delivered to one of the 4,500 local shops around the country and then pick it up at your convenience. No waiting at home for the delivery man! Every living room needs a comfy sofa or two, where you can relax with a book, watch TV or grab 40 winks. Shop from a selection of half price sofas including fabric, leather and reclining sofas, corner sofas and sofa beds all at generously discounted prices. Special Offers with Very Newsletter Sign-ups! Be the first to hear about special offers, deals and promotions when you sign up to the newsletter. Grab huge savings on a range of TVs from brands such as Sony, Samsung, LG and Panasonic. Where do I use my Very voucher code? 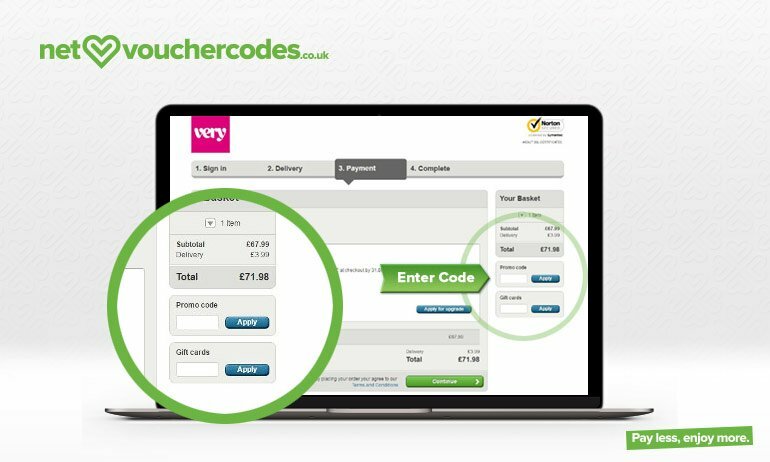 Select the code or offer you would like to use at NetVoucherCodes. Copy the code and proceed to very.co.uk using the link provided. Shop as normal and add what you’d like to your shopping basket. Click the basket icon when you are ready to check out. Click ‘Continue Securely’ to log in or register. Choose to checkout with your Very Account or with a credit/debit card. Next, choose your preferred delivery method. On the payment page enter your promo code into the box provided, you order total will be automatically updated. Click ‘Apply’ and continue to complete your order. 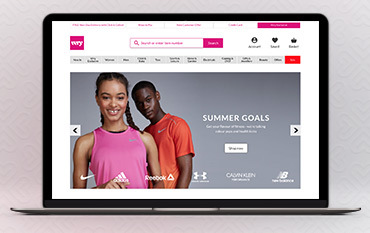 "Sign up to the free Very.co.uk newsletter and stay up to date with the latest product news, offers and more!" If you’re looking to refresh your wardrobe, lifestyle or your home you can find a world of exciting goods and inspiration at Very.co.uk. Your one stop shop for items that are on trend, practical, new and great value for money too - Very is the place to find everything you need from brands you can trust. Shop for dresses from brands like River Island, Ted Baker and Miss Selfridge, furnish your home with furniture and appliances from names like Silentnight and Swan and shop from a range of other handy collections such as child and baby, electrical goods and beauty. And it doesn’t stop there. As well as a fantastic range of apparel, gifts and homeware Very also have a handy offers and clearance section as well as Be Inspired sections that cater for all shapes, sizes, and occasions. And, if you ever fall short of ideas, you can visit the Very Inspired tab on the homepage, or browse the blog for some expert advice. Very cater’s for every age, type and style- so no matter what kind of dress you’re looking for, you will find hundreds that’ll look great and fit well, without costing the earth. Shop from your favourite labels like Miss Selfridge, Little Mistress, and French Connection, browse the standout collection from fashionista Myleene Klass and steal the spotlight at every event with elegant dresses from AX Paris and Ted Baker. Whether it’s floral printed skater dresses for the summer, jersey dresses for casual days, romantic shift dresses for evenings and special date nights or figure flattering bodycons for nights out with the girls, you can discover it all in Very’s impressive dress collection. With so many types of dresses, in petite, tall and plus size fits, there’s no need to ‘stress about the dress’ next time it comes to buying. Transform your whole home and garden with low cost, high-quality furniture from Very. Whether it’s a retro or contemporary style you’re going for, you can find all the furnishings you need to complete each room’s look and aesthetic. Discover beds, bed frames and memory foam mattresses, fabric, leather and recliner sofas, dining sets, tables and chairs and a plethora of other types of furniture such as cabinets, drawers and TV stands. You can also discover design tips and styles that’ll help you kit your home out in all the best materials and on point trends, as well as a not to be missed section that shows all the current offers and deals available on furniture. If you’re looking to add a splash of premium style to your home, shop the many designer collections available from brands like Mamas & Papas, Sealy, and Ideal Home, or if you’re working on a budget, check out the clearance section for low-cost furniture and homewares. Expected delivery: Delivery to a local convenience store within 1 day. Some promotional lines may take up to 10 days. Very will replace or refund most goods for free provided they are returned within 28 days of receipt complete, unused, in their original packaging and with any security tags intact. You can call the Customer Services Team on Freephone 0800 092 3355. They are available 7am to 11pm, 7 days a week. Or, keep in touch on Facebook and Twitter. Get the Very.co.uk app on iOS or Android. For all the must have and much-needed items for your home, wardrobe, and lifestyle visit Very - the ultimate online department store that caters for your every shopping need. With everything from fashion and furniture to electricals, gifts, toys, and jewellery, you can keep your wardrobe updated with big name brands, your home and garden in the best shape possible and every other aspect of your life refreshed and restocked for less. Shop with a Very discount code and enjoy price reductions across the entire site, or visit the offers and clearance section for great deals and money saving incentives. With Very you can also enjoy free delivery and handy click & collect services to save even more money on your order. We are constantly on the hunt for first order Discount Codes for Very to help you with your money saving. Our experts check dozens of sites for secret codes including NHS discounts, student sites & social media channels saving you time & money!